Synology Router Manager (SRM) 1.1 is the operating system that powers the Synology Router RT1900ac. With the friendly interface, it makes managing your network and Wi-Fi settings super simple, while delivering robust tools for power users and professionals. Install the DS router on your Android or iOS device and conveniently manage settings on Synology Router RT1900ac from the palm of your hand. DS router delivers robust tools and options, such as easy installation, wireless network management, real-time traffic monitoring and controls, as well as much more. Synology Router RT1900ac is designed to simplify the initial setup process. Simply plug it into your existing modem, enter router.synology.com in a web browser, and follow the interactive installation guide to finish. Equipped with three powerful antennas and support for the latest 802.11ac wireless networking standard, Synology Router RT1900ac broadcasts both 2.4 and 5 GHz spectrums for combined data transfer speeds of up to 1900 Mbps. Never worry about speed bottlenecks even when multiple people are connected to the network. For advanced home users and company admins, Synology Router Manager 1.1 delivers tools to manage connectivity so your network runs smoothly and just the way you want. For those who need uninterrupted network connectivity, Smart WAN allows Synology Router RT1900ac to connect to the Internet via two network interfaces. If one of the connections goes offline due to ISP problems or other issues, traffic can failover to the other interface. Additionally, load balancing can spread traffic across both interfaces according to customizable settings, allowing you to route traffic through a specific interface according to the destination or source address. Not sure which devices should connect to the 2.4 and 5 GHz bands? 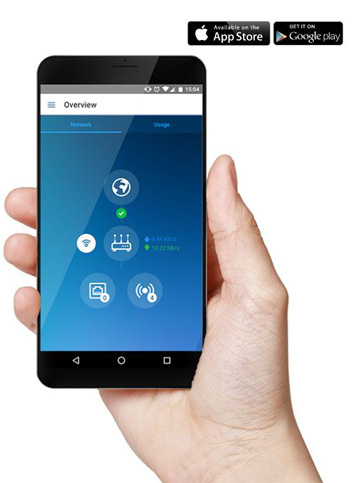 With Synology's Smart Connect wireless technology, devices are connected to the most appropriate band automatically according to preset or customizable criteria, letting users experience the best Wi-Fi without worrying about technical details. 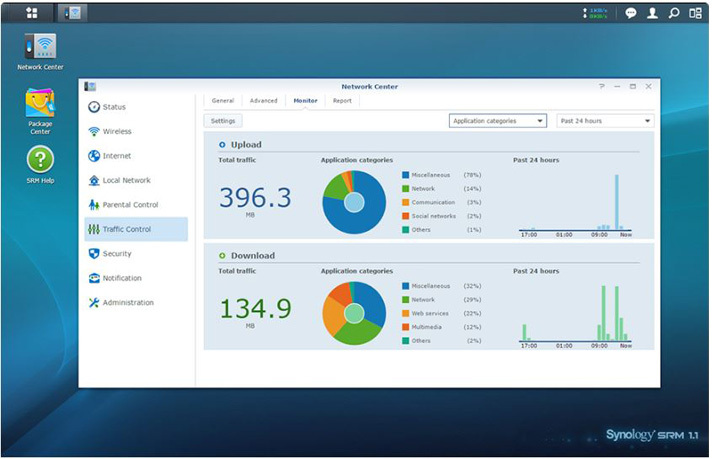 Synology Router Manager (SRM) 1.1 includes advanced traffic tools that surpass the common router. Limit bandwidth consumption, block malicious content, and fine-tune how data travels through your home or office network. The Intrustion Prevention add-on package brings intrusion detection system (IDS) and intrusion prevention system (IPS) features to actively protect your network and devices from malicious parties. IDS analyzes traffic and detects intrusion within network, thus enhancing security rules to avoid future security problems. IPS inspects network packets in order to proactively prevent suspicious traffic and requests from entering your network. This handy diagnostics tool helps you optimize and understand security settings for your specific environment. By performing a comprehensive analysis of system settings, password strength, and network preferences, Security Advisor minimizes security holes and protects Synology Router RT1900ac — and your whole network.